The Zero Net Energy Roadmap provides recommendations to help jurisdictions support and drive their local market for ZNE buildings. In its Zero Net Energy Roadmap for Local Governments, the Center for Sustainable Energy describes nine policies local jurisdictions can implement to prepare their local market for California’s rapidly approaching ZNE mandates for residential, commercial and state buildings. The first policy recommendation is to set ZNE goals at the local level. In 2011, the City of Lancaster set a goal to become the first net-zero energy city, defined as producing or procuring more electricity within city limits from renewable sources than is consumed. The driving force behind Lancaster’s ZNE goal was the vision of Mayor R. Rex Parris and the city council and their passion for cost-effective climate change solutions. The goal has two phases: first to reach 215 megawatts (MW) of renewable power capacity, then 530 MW. City leaders initially focused on solar programs and have since evolved into a more holistic look at energy, including efficiency and storage. Lancaster’s ZNE goal set a clear vision for city council, staff and the public. It brought structure and focus to the various sustainable energy initiatives under way and helped the city evaluate projects and programs using the loading order. By the end of 2014, the city was 54% of the way to achieving its phase one goal, with 117 MW of solar production operational or under construction. The city’s suite of policies and programs supporting the ZNE goal has brought financial benefits to taxpayers, schools and individual families. Following are some of these initiatives. Ninety-seven percent of Lancaster’s municipal buildings and all 25 school sites have solar, an accomplishment facilitated by a public/private partnership between the city and solar developer SolarCity. The solar shade structures on five municipal sites, including city hall and the city-owned Clear Channel Stadium, save the city an average of $50,000 per year in energy costs and during construction provided approximately 100 jobs. 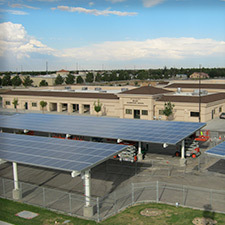 The solar panels installed on the schools, which were financed through a unique model that created an ongoing revenue stream for the city, saved nearly $421,000 in electricity costs in the first year of operation, despite an increase in electric rates. Solar developers also have installed utility-scale solar systems, with 77 MW operational and another 250 MW in the planning process. The city estimates these private developments have created more than a thousand local jobs. The city has worked with home builder KB Home to bring net-zero energy homes to the area. KB Home’s Double ZeroHouse 2.0, unveiled in 2014, is highly water and energy efficient and estimated to reduce annual utility expenses by $4,452 per household. In addition, KB Home has built more than 200 homes with solar installations in Lancaster. 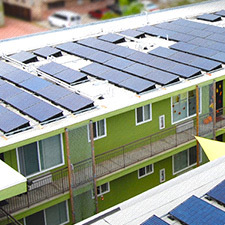 In August 2014, the city council approved the ratepayer-funded SASH program that provides rebates for solar installations on qualified low-income homes. The program also provides local students with hands-on installation experience, building the local workforce. The city is pursuing community choice aggregation (CCA) to offer electricity customers within city limits the option to procure power from an alternative provider. (The electricity would continue to be delivered via Southern California Edison’s distribution grid.) The CCA will offer two products: Clear Choice, which includes 35% renewable power, and Smart Choice, which offers 100% renewable power. For residential customers, the rate per kilowatt-hour is roughly equivalent to Edison's; Smart Choice subscribers must also pay a $10/month flat fee. Commercial rates for Clear Choice are slightly lower than Edison's rates, while Commercial Smart Choice rates are slightly higher. The CCA will seek to reduce energy costs through investment in energy efficiency, distributed generation and storage. In May 2014, the Lancaster City Council officially established the CCA program through local ordinance No. 997 and the associated implementation plan – the culmination of more than two years of groundwork. The California Public Utilities Commission (CPUC) must certify the implementation plan, which would make the CCA available to municipal customers in May 2015 and commercial, industrial and residential customers in October 2015. The city has partnered with Green Charge Networks to install an energy storage system and electric vehicle charging station at the Lancaster Museum of Art and History. The project is funded by a grant from the California Energy Commission and is estimated to cut demand charges by $3,200 in the first year. Under the agreement, Green Charge Networks will own, operate and maintain the system at no cost to the city. Storage is seen as a key strategy to help the city meet ZNE goals. The city is also working with Southern California Edison to buy back its street lights and retrofit them to LEDs. The buy-back plan is pending approval from the CPUC. The community, which is largely politically conservative and centered on the agriculture and aerospace industries, has been generally supportive of the city’s ZNE efforts. The initiatives have led to cost savings and jobs for constituents; many were developed with the input of builders and developers. Lancaster officials recognize that an opportunity for improvement would have been to incorporate energy efficiency strategies from the onset. Lancaster focused much of its early attention on solar without considering the loading order. The result has been overproduction at some facilities and potential missed opportunities for a more cost-effective approach. The most important lesson from Lancaster’s example is the importance of strong internal leadership. The mayor and city council were willing to take calculated risks and try creative solutions, and it is paying off in cost savings, job creation and huge advancements in the production of clean, renewable energy.